Sister’s are doing it for themselves, right!? It’s 2019 ladies, and we are all about GIRL POWER here at Aunty Acid! And it seems that these days, most of the world is too, doesn’t it? We’re helping each other rise, holding each other up, smashing that glass ceiling together… well, for most of us that seems to be the case, anyhow. But apparently, and incredibly sadly, there still seems to be some of our sisters out there who missed the whole “United We Stand, Divided We Fall” memo. Woman all across the globe are out here fighting the good fight for each other on all sorts of issues, but one of the hottest topics to this day still seems to be surrounding… yep, you guessed it… BREASTFEEDING. Dun dun duuuuuuun! You see, Veteran mom’s more often than not, luckily, stick up for those who are still breastfeeding. After all, they know what it’s like. Alas, we seemed to have found that one, elusive veteran mother who is just NOT willing to get with this carefully curated program. 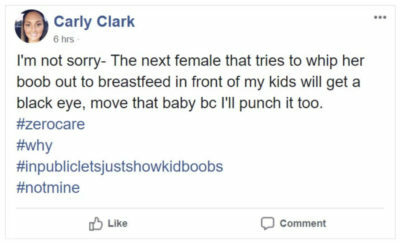 Meet Carly Clark – Carly hails from Spartanburg, South Carolina and has recently angered literally the entire population of the internet after she threatened nursing mothers of the world on Facebook. Smart move Carly, super smart move. 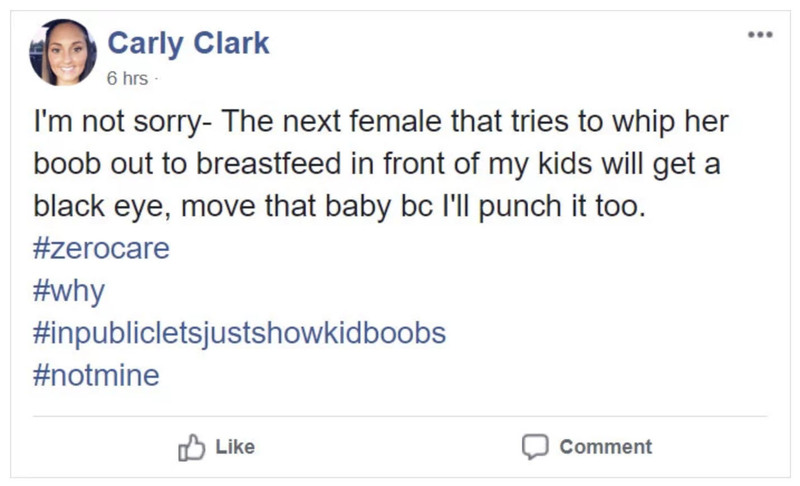 In a post she made way back in July 2018, and unsurprisingly has since been taken down, Carly did not hold back and very clearly expressed her sentiments towards what she deems necessary violence… and the backlash started pretty much immediately after she clicked the “Post” button. Yep, I know. 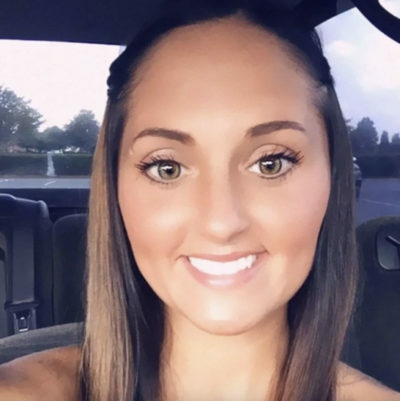 And I swear this is a real freakin’ post from an actual freakin’ mother, can you believe it? Because I know I absolutely cannot. 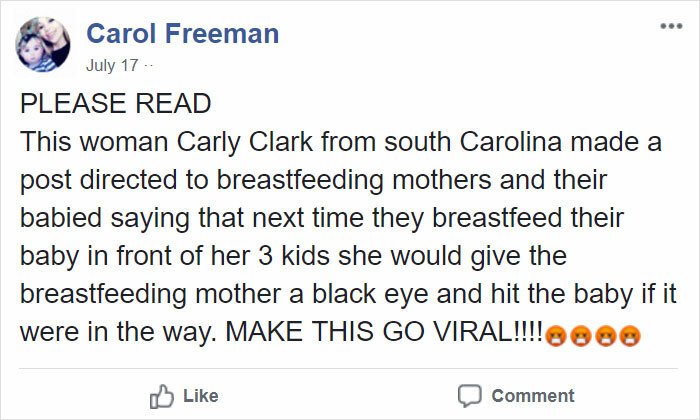 And of course, people who saw the post were outraged immediately and wanted to make sure the despicable post was seen by mothers (and literally everybody else) as much as possible. Ah… the advantages of the internet!